If you are an adventure lover, you should definitely try out for Mera Peak climbing once in your entire life. 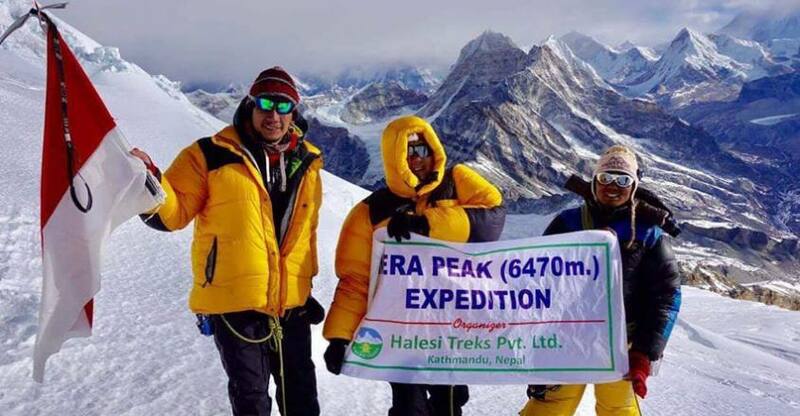 Mera Peak Climbing Trek, as the name highlights will take you to the highest trekking peak of Nepal i.e. Mera Peak at the height of 6476meters. 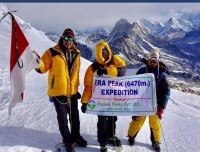 In addition, if you succeed to reach the summit, you will experience an excellent viewpoint on your trip to Nepal. The peak lets you get panoramic views of five of the mountain peaks at about 8,000meters. These are Mount Makalu, Mount Kangchenjunga, Mount Cho Oyu, and almighty Mount Everest. 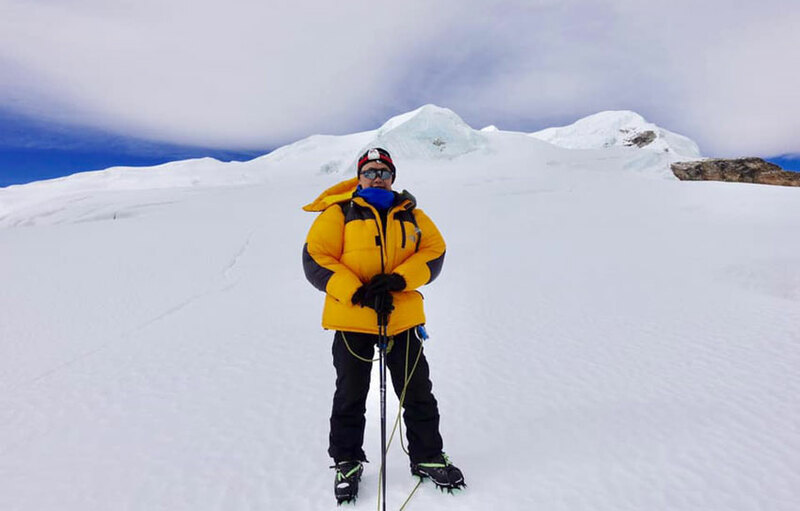 As mentioned before, peak climbing to Mera Peak involves walking to reach the highest point, our team plans the complete trek in such a way that you get enough time to have rest and acclimatize yourself. The trek commences with your flight to Lukla followed by crossing the Pangkongma La Pass to enter Hinku Valley. 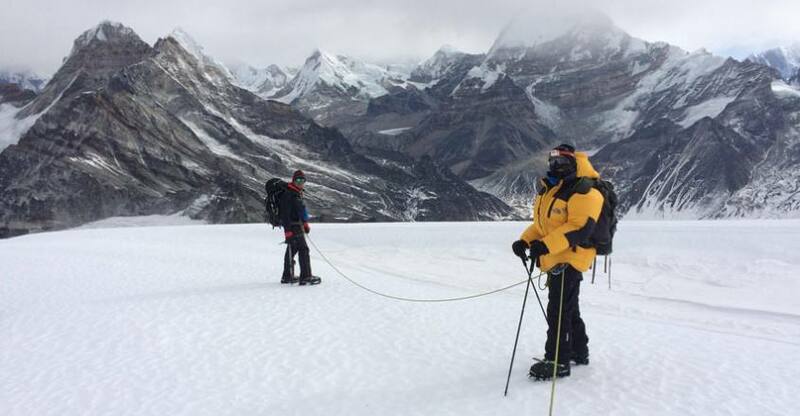 Make sure to get spectacular views of Chamlang and Baruntse, both of which are of 7,000meters and large numbers of glacial lakes during your trek to Mera Peak. Even though you have to follow a long route, the complete trek is a fantastic yet a memorable one. Thanks to large numbers of small villages and rhododendron forests, which one in your way while you weave through green fields to reach to the mountain. What would be better than reaching at the highest point in Nepal (in terms of trekking peaks) by interacting with friendly local area people and enjoying majestic views of the entire Himalayan region? Day 02: Kathmandu- Lukla (2800m) - Chhutenga (3474m).4 hrs. Day 03: Trek to Thuli Kharka (4320m.) via Zwatra la (4600m. 5-6 hours. Day 06: Thaknak to Khare (5,045m). 2-3 hours. Day 07: Rest day in Khare/Acclimatization. 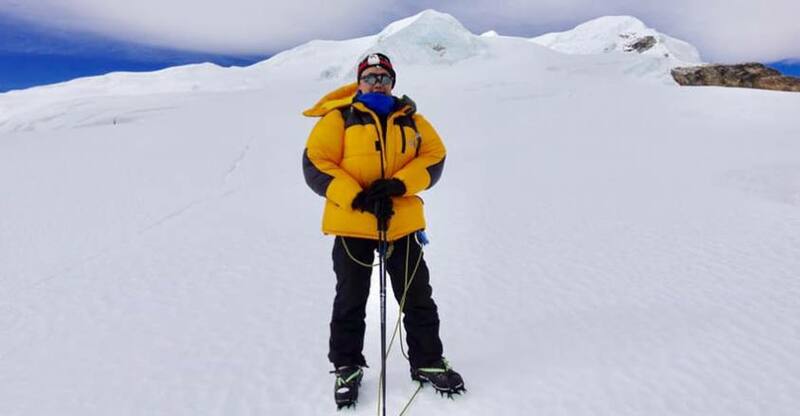 Day 09: Mera Base Camp to High camp (5,780m). 4-5 hours. 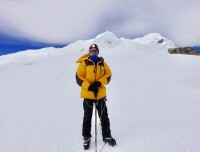 Day 10: Mera High Camp to Summit (6,461m.) and back to Khare (5045m. ): 8-9 hours. Day 11: Reserve Day for bad weather. 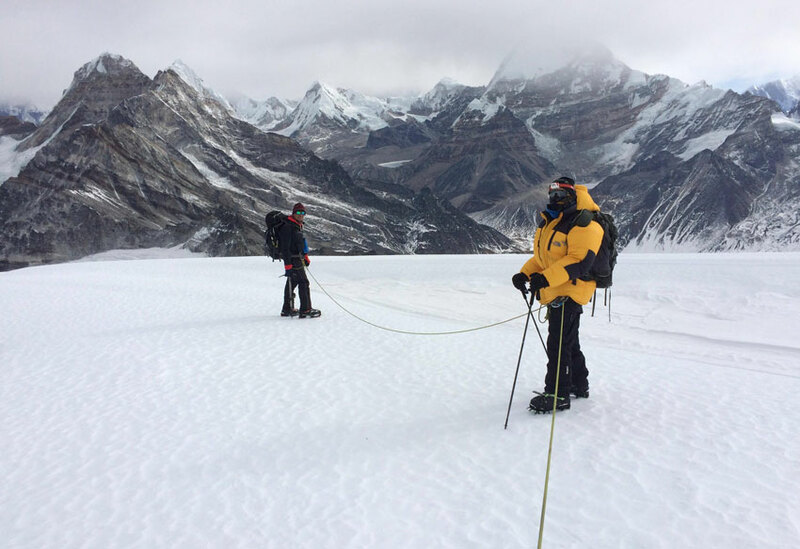 Day 12: Khare to Kothe (3600m. 4-5 hours. Day 13: Kothe to Thuli Kharka: 5-6 hours. Day 14: Thuli Kharka to Lukla: 6-7 hours. Land at Kathmandu Airport. Transfer to hotel by our tour representative. Relax at the hotel. Take a flight to Lukla. After landing we start our trek to Chhutenga.An easy trail from through rhododendron and pine forests. Reach Chhutenga. overnight at teahouse. Early morning, we trek over a steep uphill trail than we cross of Zatrawala Pass (4600m.). At the top of the pass, appreciate the panoramic views of mountains like Kongdi Ri, NumburHimal, Karyolang Peak etc. Then trek proceeds along the leveled path then trek downhill till Tuli Kharka.overnight at the teahouse. Today we trek uphill and downhill through the dense forest of rhododendron, oak, juniper, and pine trees. Also, enjoy majestic views of Mera Peak and the other snow-capped peaks en-route. We take a sheer downward trail to the Hinku River and a then uphill trek to reach Kothe. overnight at teahouse. Today we trail through the ridge of the HinkuKhola. Beyond Gondishung, we go by a 200-year- old Lungsumgba Gompa. Here we can discover Mera Peak. A short trek takes us to Thaknak, a summer grazing area. overnight at teahouse. After breakfast, we trail the parallel Dig Glacier moraine to Dig Kharka, which gives panoramic pictures of CharpateHimal. We trek climbing via moraines to the snout of the Shar and HinkuNup glaciers. Later, scend more steeply to Khare. Here, we observe the northern face of Mera Peak. In addition, our climbing guide will advise us to polish our fundamental climbing procedures. overnight at teahouse. Today spend the day to get acclimatized for the trek further. We stroll in and around Khare to explore the region. climbing sherpa teach you basic things about climbing. overnight at teahouse. Today we trek through a rock covered trail to reach the Mera Peak Base Camp. Spend overnight at tent in Mera Base Camp. Today we trek further through the Mera La pass to reach the Mera High Camp. Our trail is through a rocky path, which can be risky if it has snowed because there are a lot of chasms in this area. We trek till the top of the rock band. Next, we set up a high camp and enjoy wonderful landscapes of Mt. Everest, Cho Oyu, Makalu, the south face of Lhotse, Chamlang, Nuptse, and Baruntse. Spend overnight at the tent in Mera High Camp. Today is a really significant day for our trekking journey. Early morning after breakfast we begin the trek towards the glacier till a peculiar ridge. Enjoy the panoramic scenes when first rays of the sun reflect at the snow-topped peaks. We gradually ascend higher into the thinning air. At the final steep summit slope, we may use a fixed rope if required. Reach summit. Here we have breathtaking scenes of the magnificent Himalayas such as Mt. Everest (8,848m), Lhotse (8,516m), Cho-Oyu (8,210m), Kangchenjunga (8,586m), Makalu (8,463m), Nuptse (7,855m), Chamlang (7,319m) etc. After taking some photos, we retrace our steps back to the high camp. Rest for a while then trail towards Khare. overnight at teahouse. This day is reserved as an alternative for climbing summit if we failed to do so previous day due to bad weather. After breakfast, we trek to Kothe along the similar trail used before. On reaching Kothe, relax after spending tough days of trekking.overnight at teahouse. Today we trek to Thuli Kharka. We trek uphill and downhill, pass some streams of the InkhuKhola. We trail on our right and proceed hiking. We pass by a Chorten then we descend on a steep trail. Further, we climb to Thuli Kharka and visit another Chorten on the route. ReachThuli Kharka.overnight at teahouse. After breakfast, we cross the Zatrwa-La pass (4,600 m). After crossing the pass, we go along the scene of the beautiful Lukla Valley surrounded by Cho Oyu, NumburHimal, Kongde Peak, Kusum Khangru and others. From Zatrwa La pass we trek down to Chutang. Reach Lukla village. overnight at hotel. After breakfast, we board an early morning flight for Kathmandu. On reaching rest or do some shopping. You can also explore the famous tourist places of Kathmandu. Our tour representative can help you with sightseeing.overnight at hotel. The below-given cost is per person and the below-given Mera Peak Climbing fixed departure dates are available for you. If the given date is not favorable then please contact us and we will happily customize your trip on dates more appropriate for you.